4. 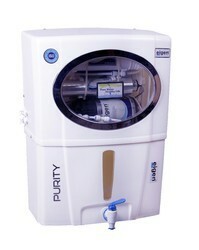 Domestic Ultra Filtration Water Purifiers. 5. 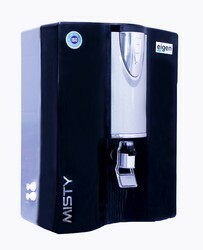 Domestic Ro UV water purifiers. Reduces TDS (Total Dissolved Solids) such as Salt, Iron, Sodium, Calcium, Copper, Fluoride etc. up to safer levels. Provide pure, tasty & real drinking water. We are engaged in offering our clients with a comprehensive range of Eigen Water RO Systems. These have the capability of online water supply at lower running costs. Our range is stringently checked on various parameters to ensure its compliance with set industry standards and longer functional life. These purifiers are ideal for domestic use and can purify water from different contamination. 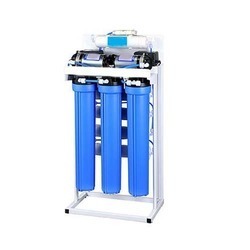 Advantages: Low running cost, Auto Power on/ off, Online water supply, Five stage filtrations, Visibility of pure water, Storage capacity 8-14 Liters, Table Top or Wall mounting option, Round the clock pure water availability, Production capacity 10/12 Liters per hour, Power consumption 25W approx. (when in use), High quality membrane and other filter cartridges, 90 to 95 % reduction of TDS (Total Dissolved Salts), Option of Low Pressure Switch to protect the system from dry run, Option for auto flushing to enhance the life of RO membrane. Capitalizing on our in-depth industry expertise, we offer a superior range of Eigen Water RO System to our clients. Our range is also available in different specifications that meet the individual requirement of our clients in the best possible manner. 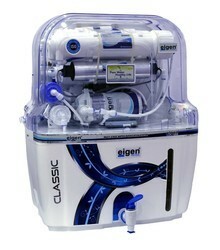 These are a water purifier system that removes impurities from water. We also meet the bulk demand of our clients within a given timeline. Advantages: Low running cost Auto Power on/ off Online water supply Five stage filtrations Visibility of pure water Storage capacity 6-8 Liters Table Top or Wall mounting option Round the clock pure water availability Production capacity 10/12 Liters per hour Power consumption 25W approx. 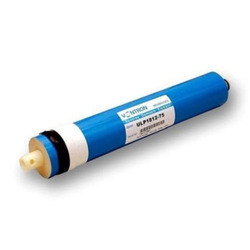 (when in use) 90 to 95 % reduction of TDS (Total Dissolved Salts) High quality membrane and other filter cartridges Low Pressure Switch to protect the system from dry run Option for auto flushing to enhance the life of RO membrane. . Option for Alkaline AAA Filter. We are importers of Vontron RO Membranes like filmtec (dow), Pentair, CSM, vontron in all capacities and manufacturers of inline filters (sediment, pre-carbon and post-carbon) manufactured with high quality material.